Things are spooky enought for a group of children and counselors trapped overnight at Camp Gitchiegoomie on October 30, 1938. But when someone turns the radio on to Orson Welles’ imfamous War of the Worlds broadcast, the scary stories told around the campfire are no match for the thrills and chills of the hysterical “Martian invasion” that actually panicked America that night. 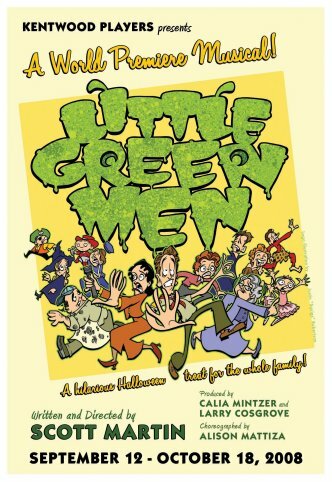 Little Green Men is a fun-filled nostalgic comedy for the whole family, written in the tuneful, toe-tapping style of the classic MGM musicals, with plenty of singing and dancing and hilarious Halloween surprises!